USA has had 50 states since 1959. The District of Columbia is a federal district, not a state. Many lists include DC and Puerto Rico, which makes for 52 "states and other jurisdictions". Maybe that's the root of the myth? Or do people think of a deck of cards, the weeks in a year, or the country code of Mexico? Does the number 50 appear to be too rounded to be accurate? 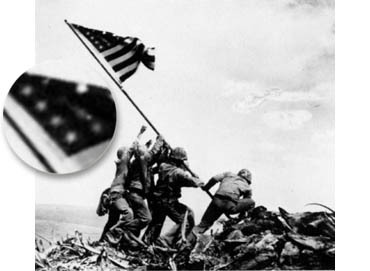 The flag has 50 stars, one for each state. It is updated as needed. Counting stars might sound like a pastime for really bored nerds, but since the stars are arranged in certain patterns, some of which are quite distinctive, a small piece is often enough to identify the version of the flag. In this flag there are six rows of stars, with the 3rd and 5th being longer than the 2nd and 4th - this doesn't match any of the flags above. 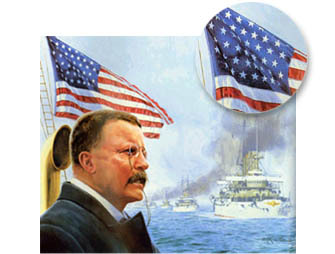 That is what one would expect from a historically accurate painting, since Teddy's fleet sailed in 1907. See the links below for this version of the flag, and many more.